The spun glass caterpillar, Isochaetes beutenmuelleri. Click to enlarge. I was in Kentucky last week, relaxing with horses, caves, and bourbon. While walking in the woods at Mammoth Cave National Park, I saw this lovely larva, commonly called the spun glass caterpillar. 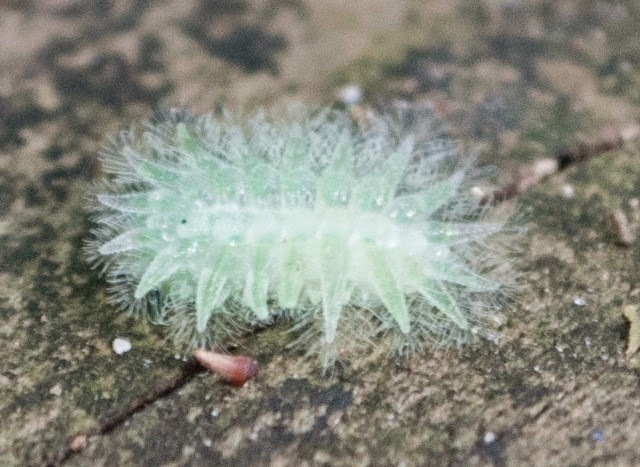 It is about 3/8 of an inch long and almost as wide, pale green, practically transparent, and covered with spines and hairs. It looks like a miniature Christmas ornament. Its main food is the foliage of the swamp oak tree. Theoretically, they can be found from New York to Florida and west to Texas and Colorado, but they are uncommon and I had never seen one before. It grows up to become a relatively drab moth, which you can see by clicking on this sentence. And if you harassed it, those spiny bits would fall off! Limacodidae larva have all sorts of weird external doo-dads, and are freakish in a range of entertaining ways!